Today is Day 1. Meijin Habu became Sente player. The game will end tomorrow evening since the allotted thinking time per player is the longest(9 nours). The game seems to be available to watch here unofficially. Japanese-Games-Shop.com announced the price reduction of some shogi sets in its blog. Please click the following link to read if you are interested. Its shop site can be fined here. I added the two tickers to the top area of this blog. As you may be already aware, I added the two tickers on the top area of this blog. Here are the explanation of what are to be shown there. "Attention!" is to show the recent 10 bookmarked pages of my shogi-attention. "New Kifus" is to show the recent 10 games of my KifubyOpeningStrategy. If you click a ticked headline, then you will jump to the linked page of the headline to read and/or watch. Reijer's shogi pages are back now. All the links from this blog to his pages have become alive again accordingly, though they were dead approximately for one month. Here is the link to an article titled Hilton on Foxwoods: Shulman, Shogi and Imitating Becerr. The author played a chess against Moriuchi 9 dan at the 6th round of Foxwoods 2009 chess tournament. You can replay the game on the linked page. The website of worldshogi.com seems to be active now. It reported the winner of the Poland for "3rd World Shogi Championship" on April 11. Poland is the first country to announce a winner of its preliminary tournament for the 3rd Shogi World Championship Tournament, which will be held in the weekend of November 13-15, 2009, in New York, hosted by New York Shogi Club. For more details, please click the link above. Here is the information page of Shogi World Championship Tournament. At 18:05 of the Central European Time, the 2nd PlayOK biggest shogi tournament organized by wwwshogipl will be held soon. Participants are requiered to go to the tounament room to sign-up from 17:50 to 18:00(CET) after logging in PlayOK. Here are the information about the shogi event to be held on April 11 & 12. The Consulate General of Japan in San Francisco is sponsoring a variety of events during the first weekend of the Cherry Blossom Fetival (April 11-12) in Japantown. • Shogi Festival. In conjunction with 2009 U.S. Shogi Championship, the Shogi Festival will be held from 10 a.m. to 4 p.m. both days on the second floor of the Japan Center’s Kinokuniya Building, Post and Webster streets. Professionals from Japan will be in attendance, including Hisashi Namekata, 8th dan; Akio Ishikawa, 7th dan (U.S. shogi master); Hirotaka Nozuki, 7th dan (San Francisco Branch master); Akira Nishio, 5th dan; and Yusuke Tohyama, 4th dan. They will give a free shogi lesson, provide professional tips and demonstrate a professional blindfolded game. This year the Consulate General of Japan is proud to be a sponsor of the SHOGI Festival at the 2009 Northern California Cherry Blossom Festival to be held in conjunction with 2009 US Shogi Championship. Professionals from Japan will be in attendance including Mr. Namekata 8th dan, Mr. Ishikawa 7th dan (US Shogi Master), Mr. Nozuki 7th dan, Mr. Nishio 5th dan and Mr. Tohyama 4th dan. They will hold a free shogi lesson, provide professional tips and demonstrate a Pro's Blindfold Game. Here is the Flyer of the shogi event. 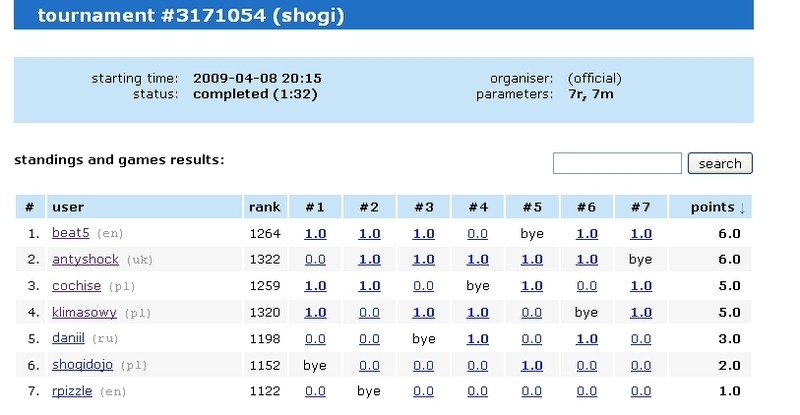 Beat5 is the winner of the captioned on-line shogi tournament held on April 8, 2009. Here is the link to the result.